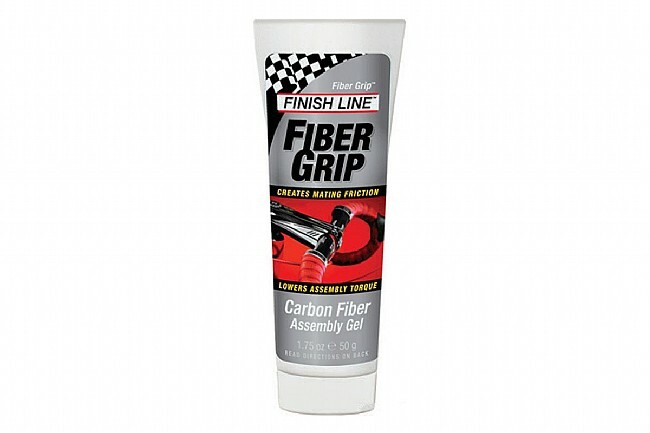 Finish Line's Fiber Grip formula holds tight on carbon clamp surfaces by creating friction, eliminating the need to over tighten fragile and expensive parts. Plus, it's non-toxic, clear and won't stain. 1.75 oz tube. Finish Line Fiber Grip is great for making sure your carbon seat post won't slip, and you don't have to over-tighten the seatpost clamp. This stuff provides excellent grip on carbon without inducing fear of carbon damage. Only downside is the tube size this stuff will last several generations of home-mechanic cyclists. Wish they had a smaller version as I am guessing it will take decades to use such a large amount!!! My carbon seat post was slipping until I used this product. Now no more slipping. Works as advertised. I have been fighting a slipping carbon seat post for years on my wife's road bike. I tightened it to specification with a proper torque wench to no avail. With my first application of this stuff it stopped slipping. Five rides later and it is still in place. The real bonus is it cost less then other products that do the same thing. I can't recommend this product enough!